Can Louisiana Coastal Restoration Succeed Despite Climate Change? Coastal Louisiana faces a triple threat from rising sea levels, increased storm intensity and growing energy costs. While these are not necessarily new issues, there are growing concerns over the seeming inevitability and full reality of the implications of these threats. Without fast action, Louisiana will lose thousands of more acres of wetlands that provide critical habitat to wildlife and fisheries, as well as risk reduction benefits to coastal communities throughout the state. But with increased projections of sea level rise and new climate science that paints an even more dire picture for coastal Louisiana, some ask if there is still time to restore the coast and whether expensive restoration projects will be able to do just that. While we may still be able to mitigate some effects from climate change, others will require adaptation and changes to our way of life. In order to minimize future land loss and help communities, industries and species adapt to what’s coming, we must acknowledge and understand what we’re up against. The mean global temperature is predicted to increase by up to 10 degrees Fahrenheit before 2100. This temperature increase will result in 15 to 40 inches of increased sea levels. If this happens, much of southeastern Louisiana will be underwater. The Mississippi River Delta is particularly vulnerable because of high rates of subsidence, or sinking land. Levees and river control structures along the Mississippi River prevent sediment from replenishing and rebuilding delta wetlands, which compounds the threats of sea level rise and subsidence. Over the past 50 years, the sea surface temperature in the tropics has increased by around 1.8 degrees Fahrenheit, contributing to an 80 percent increase in the intensity of tropical storms and hurricanes. 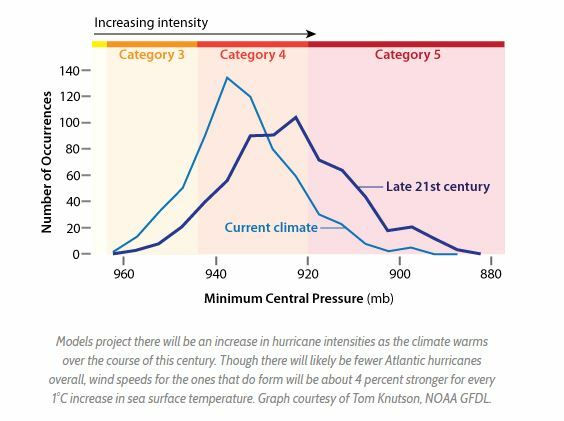 Although the 2014 International Panel on Climate Change and National Climate Assessment reports project there will be fewer tropical storms in the North Atlantic Basin, with the ocean continuing to heat up, the hurricanes that coastal Louisiana and the Gulf of Mexico will experience will be larger and stronger. The increased intensity of hurricanes, combined with the complacency that often comes with storms being fewer and farther between, could be devastating for coastal communities. The 21st century economy depends on energy production. The demand for oil has been on the rise, and as the demand rate approaches the current supply rate, energy prices will begin to increase. In the last decade, energy costs have increased by a factor of five, and economists expect this trend to continue. Expensive energy makes many restoration projects, such as marsh creation or barrier island restoration, more costly to build. Paradoxically, the continued use of fossil fuels as an energy source will continue to accelerate sea level rise, making coastal restoration even more imperative. Comprehensive restoration efforts already underway provide a hopeful path forward for coastal Louisiana through implementation of large-scale projects that will restore natural processes, build new land and increase resiliency of our wetlands. These projects must be constructed with expediency, however, for the maximum benefits to be realized. Sediment diversions, which build land by depositing sediment into surrounding wetlands using the natural power of the river, are the most promising project type in our restoration toolkit. Diversions have the potential to build thousands of acres of land over time, and they will build more land the longer they are operated – but these complex projects take years to plan, design and construct. For diversions to be a successful restoration tool, they must be designed to minimize energy inputs and they must be constructed quickly. The current science suggests that diversions and other large-scale restoration efforts will result in long-term economic and environmental security if designed sustainably and implemented with urgency. Restore the Mississippi River Delta is working to support research on low-energy designs and accelerate the approval and construction of diversions. Restoration can still succeed in the face of climate change and increasing energy costs, but we must act quickly to keep our heads – and our homes – above water. This is part 9 of our ongoing series where our experts answer 10 fundamental questions with new and updated information, so that reasonable and scientifically-sound decisions can be made about the long-term sustainability of the delta and surrounding ecosystems. View an introduction to this series as well as posts on sediment, vegetation, diversions, levees, communities, fisheries, and navigation.